PlayStation Plus subscribers will be able to add two more free games to their collections starting tomorrow. Obviously, the big PlayStation-related news of the month is all about last week's launch of the PlayStation 4. However, just because Sony released a new console doesn't mean it's forgetting about its existing systems. The publisher announced on the PlayStation Blog that it would be adding two more games--one for the PS3, one for the Vita--to the PlayStation Plus Instant Game Collection on November 19. That means starting tomorrow, Binary Domain and the Vita version of Oddworld: Stranger's Wrath will be free for PS+ subscribers. 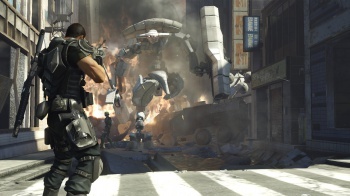 Originally released in early 2012 for the PS3, Xbox 360, and PC, Binary Domain is described as "a fast paced and intense battle for humanity in a robot-filled 2080 Tokyo." Stranger's Wrath, on the other hand, is a high-def upgrade of a 2005 original Xbox title, and the fourth game in the Oddworld series. These are just two of the offerings Sony has provided to PS+ subscribers this month; PS4 early adopters were treated to downloadable titles Contrast and Resogun for free as well. Personally, I think PlayStation Plus is worth the subscription fee just for the Instant Game Collection; it more than pays for itself in free games every year, and this month's offerings have been solid. I guess I'll have to be content with Stranger's Wrath until that long-awaited Abe's Oddysee remake finally appears.